Our family has been playing cards every night around bedtime, sadly often in place of reading a book. But, that’s okay in this case, because we’re playing Whizizzle, a new phonetics game. 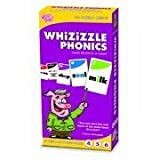 Whizizzle is not unlike Crazy Eights except that the families of items are phonetic sounds that players must match with cards with similar sounds. Adults, and other players, are supposed to say out loud the word containing the sound so that smaller players get the hang of the phonetic pronunciation. The game has a few twists with “action” cards that players can use at any time to change the direction of play to force the next player to draw a card. Trumping almost all strategic action though, is the all-important “change the vowel” card, which allows a player to use any sound, usually to win the game. We think the best toys and games are ones that can motivate the whole family to play. No child wants to stand around begging adults to play some mind-numbing game that they only play once and begrudgingly. While I can’t say they’ll be adding Whizizzle to Las Vegas card game favorites, I’ve been happy playing Whizizzle almost every evening for the past two weeks. My nine year old loves the game and delights in helping her little brother learn the basics of reading. And, my five year old is just starting to get the idea behind the sounds. The only drawback that I see for the game is that they could have integrated picture clues into the cards so that pre-readers could associate the sound with a word they could identify. As it is now, my little boy has to wait for us to read what is on his card. Eventually, he will read them too, but for now, all he can do is identify the letter without the corresponding, and very important, phonetic sound. Whizizzle comes in two packs, 1-3 and 4-6. 4-6 is only slightly more advanced. $14.95 at Amazon.